Continuing in my set of blog posts previewing my upcoming application, Meerkat, I'd like to take a moment to show off another handy feature of this SSH tunneling utility. I often find that when I'm setting up an SSH tunnel, even though I know my way around the tool pretty well, I have to consult the man page to figure out what flags to use and which direction to setup the hosts. It can get confusing. That's why in Meerkat, I've created a setup assistant which helps guide you through quickly setting up a tunnel. While you can use the normal interface, particularly when you're editing an existing tunnel or are very used to the process, the setup assistant walks you through the basics quickly. 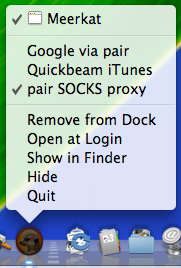 I'm hoping that this feature will help people more easily setup SSH tunnels with Meerkat. Stay tuned for more preview details soon! And for my next app... Meerkat! I'm happy to announce that I'm very near the beta stages of my next application -- introducing Meerkat! In this post, I'll cover a couple of the major features of this new utility, but stay tuned for more info in future posts! 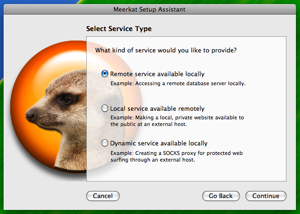 Meerkat is an SSH tunnel manager designed for the developer or systems administrator with the need for multiple tunnels and advanced, automated management. 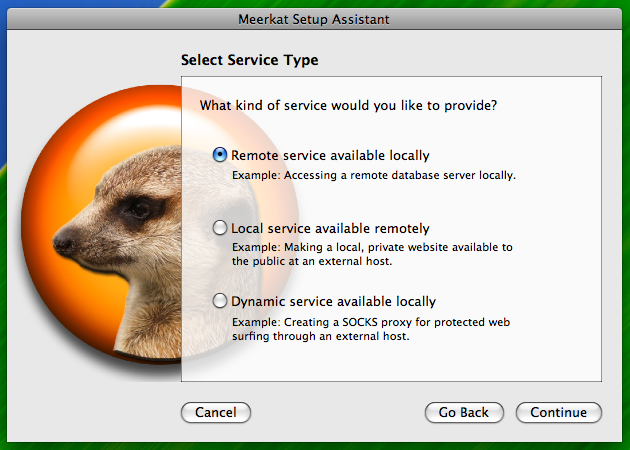 Meerkat allows you to easily set up SSH accounts and associated tunnels and activate and deactivate them via the main window, the dock, or the status bar. Meerkat integrates with Growl to notify you of background tunnel management. One of Meerkat's signature features is application triggers. 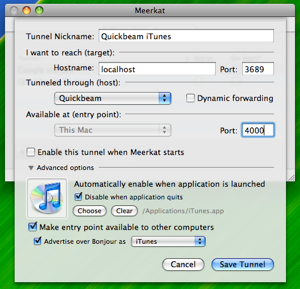 Meerkat can automatically bring up or tear down tunnels in response to applications that you launch and quit. 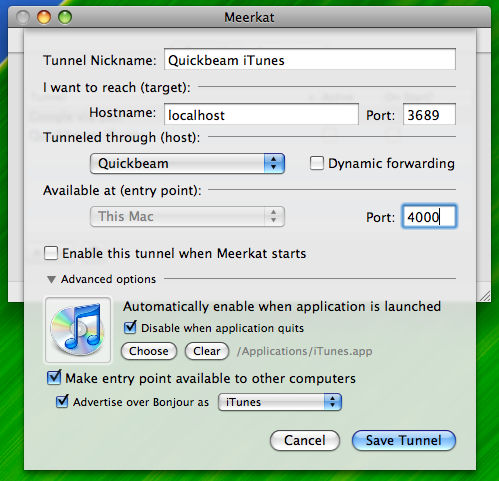 On top of this, Meerkat can optionally advertise your tunnel endpoints over the LAN via Bonjour, Mac OS X's convenient networking protocol. A great, practical use of this is connecting to your home computer's iTunes collection and having it show up in your local iTunes, no matter what kind of firewall you may be behind (providing it allows SSH, a secure, encrypted protocol). Another use for Meerkat's Bonjour feature is to securely provide access to a remote database server to a local office for development purposes. The possibilities are endless -- Leopard's Finder uses Bonjour to see VNC servers, Safari recognizes web servers on the LAN using Bonjour, and Terminal uses Bonjour to find SFTP servers. 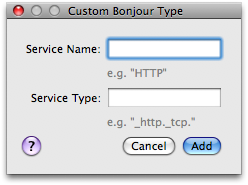 And you can define custom Bonjour protocols to meet your own needs.